Thanks to Alix, we're here! 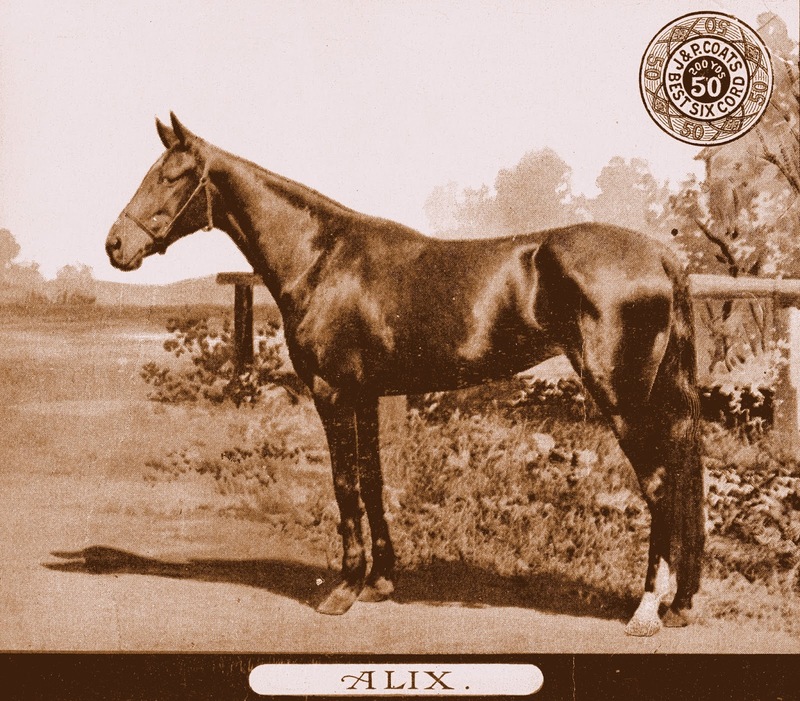 The reverse of Alix's card stimulated our interest in the Pawtucket operations of J & P Coats. Location, location, location is the mantra of the Real Estate industry. Profit, profit, profit motivates corporate decisions. 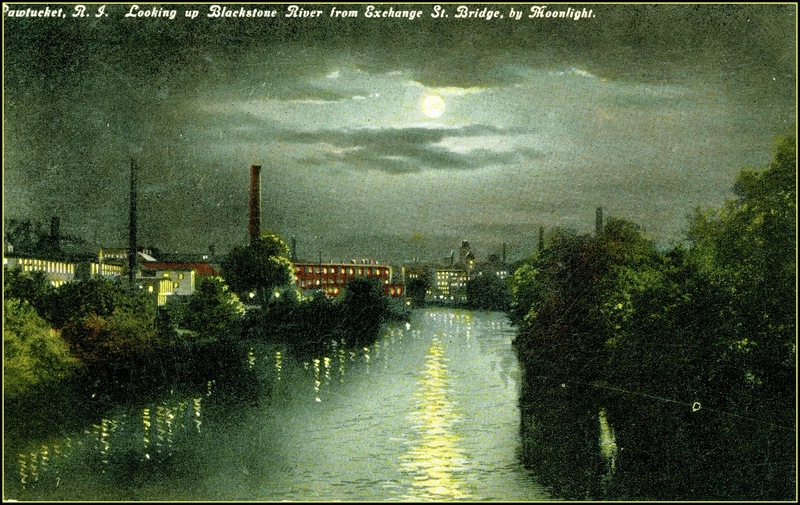 In the 19th century, cheap water power and inexpensive transportation to market gave New England manufacturing locations advantages. In the mid-20th century, however, locations in the northeastern United States began to lose their hold on industry as labor costs gave other locations, both within and outside the US, decisive advantages for those concerned with profit margins. Welcome to old Pawtucket, RI ! 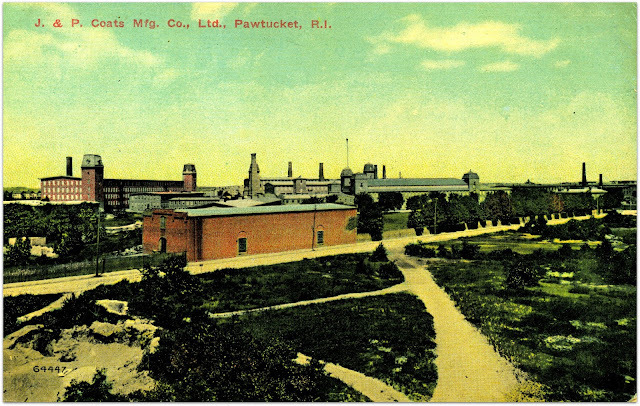 J & P Coats once employed thousands in Pawtucket RI. Today, its successor company, Coats, records its history on the company site. This all looks very positive, with the emphasis on growth and mergers and innovation. Anything missing? Why yes, now that you mention it. It was during the 60s that Coats left its Pawtucket employees behind, all 4,000 or so. The importance of Coats to Pawtucket was described in Slater Trust Company, "Pawtucket Past and Present, being a brief account of the beginning and progress of its industries and a resume of the early history of the city." (1917). Rhode Island History.Book1, p.22. This selection is part of the United States History Commons. Typical of much 19th century mill architecture is the Conant Co. tower shown next. You can spot such towers on the buildings on both the 1877 and 2018 maps below. Below is an 1877 map (credit: Library of Congress) showing the Conant Co. buildings (marked "2") to the left of Pine St. across from the Fales & Jenks Machine Co. I'm not sure how the pond in left center survived all this industrial activity intact, but it appears to have come through with a clear, unpolluted appearance in the 2018 photo (credit: Google Maps). Click on the map images to enlarge them. What was it like inside these mills when they were in working? We can show you one of the operations from 1956. If there were a sound track on this film, you probably wouldn't want to listen to it. Workers just had to get used to cacophony. Click the arrow to watch on this page. A woman who used to work in one of the Lowell, MA factories describes the sound for us in the video below. I've started this clip 18 minutes into the original 27 min.YouTube post. 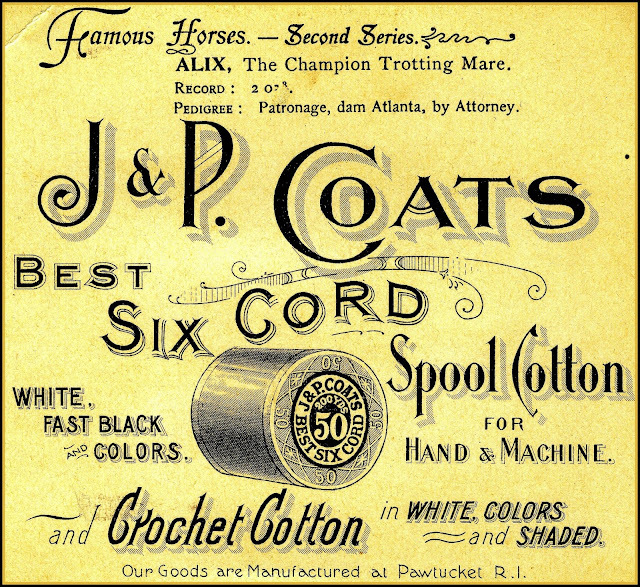 While adults staffed most 20th century American thread mills, the history of employment in these places both in America and Scotland, where J & P Coats originated, was sordid. In 2018, many industries, deprived of cheap labor in their countries of origin by union contracts and child labor laws, have distinguished themselves by chasing cheap labor, first to southern states of the US and then by moving their factories to countries where cheap labor abounds. The 15 min. documentary below introduces us to the labor practices prevalent in industrialized Britain in the late 18th and 19th centuries. The worldwide persistence of this pattern of exploitation into the 21st century is remarkable and speaks poorly of those of us who allow its persistence anywhere. Part 1 of a BBC documentary ~ 15 min.